Reader's Digest Association, 9781621453239, 256pp. Leon Logothetis's life was well plotted out for him. He was to do well in school, go to university, get a job in finance, and spend the next fifty years of his life sitting behind a slab of wood, watching the rain-slicked streets of London from thirty floors above. For a long time, he followed that script, until one day, he finally realized he was living someone else's life--a good one--but not one of his own choosing. The wisest words he heard, and the greatest lessons he learned, came from everyday people he met on his travels. He became their accidental student, and after years of sharing those lessons through TV shows, college tours, books, and in the media, he realized that he had also become an accidental teacher. His experiences are more than a collection of stories, they have become a way of life--the Way of the Traveler. So, what is the Way of the Traveler? It's a roadmap to living your best life, loving with all your heart, and exploring the world--both the great and adventurous one waiting outside your door, and the even greater, more adventurous one waiting within your soul. 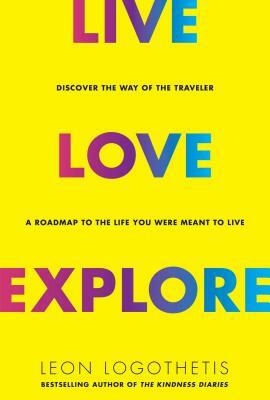 Weaving together Leon's hilarious and heartwarming stories of his misadventures on the road with simple but profound exercises to help you uncover your true path, Live, Love, Explore will teach you how to live fully and without regrets. It's not to say that everyone who reads it will have to go to the ends of the world. Because you don't have to go to Mongolia to discover the truths that lie inside. No, those life lessons can just as easily be learned from the people all around you--the chap serving you coffee at Starbucks, the woman sitting next to you on a plane, your co-workers, family, and friends. There's an entire world of people willing to teach you their lessons if you're willing to learn. And by opening yourself up to new adventures, by recognizing that you have the freedom to choose your own road, you'll find something else that has been hiding in plain sight: you'll find the life of which you have always dreamed... and the curiosity and courage it takes to make that life happen. Leon Logothetis is a global adventurer, motivational speaker, and philanthropist. Formerly a broker in the city of London, he gave it all up to travel and find real human connections. Author of The Amazing Adventures of a Nobody and The Kindness Diaries, Leon also hosted television series of the same names, which have aired in more than 100 countries. He has documented his travels for numerous media outlets including Good Morning America, Los Angeles Times, San Francisco Chronicle, Outside, and Good. In addition, Leon is the founder of the Human Interaction Project (HIP), which provides interactive learning opportunities for youth and adults alike by combining volunteerism with self-growth. He lives in Los Angeles, California. For additional information, please visit www.WayoftheTraveler.com.